Electrify your life and expand your horizons is the theme for 2019, as this year promises the start of an exciting journey towards freedom, liberation and soul-awareness. We will find ourselves learning many valuable lessons as we swim through the sea of our imaginations. Much of our philosophical beliefs, idealism, and beliefs will be challenged and transformed into new ones. Many of these changes have been occurring over the last few years but in 2019 they will become more evident. There will also be a serious side to the year ahead as the eclipses focus our energy on building new foundations and structures, but overall, 2019 should bring many opportunities for positive world changes. The year begins with fiery Mars in its own home sign of Aries; in fact, there are three other planets in their home signs as well, making it four planets in their ruling signs. Mars is in Aries, Jupiter in Sagittarius, Saturn in Capricorn and Neptune in Pisces. This doesn’t happen very often. So, what we may be seeing as the New Year begins is the energy of these planets reflected in a big way in our own lives and the world at large. With these planets in their own signs we will feel a pioneering spirit and sense of adventure into the unknown. These planets and signs have all the right ingredients for creating our vision for the future and then pursuing our goals, so don’t hold back. Adding to the momentum in January will be a Solar Eclipse in Capricorn on January 5th, indicating that the time for dreaming is over: action is now needed. Also, Venus conjuncts Jupiter in late January, shortly before a spiritual Saturn-Neptune trine – these influences help to birth a spirit of generosity which will shape the months ahead. There will be some resistance, notably in mid-February when volatile Mars conjuncts Uranus in a warrior mood, so we can’t expect voices of reason to triumph without a struggle. 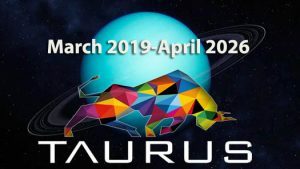 In March, however, Uranus settles down into Taurus, having briefly visited in 2018 – this energy brings upheaval in the financial sector but also potential progress in tackling environmental concerns and inequalities. 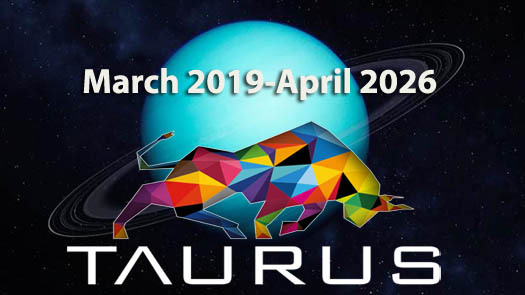 Uranus turns direct in Aries on January 6th and once it moves into Taurus on March 7th will remain there for the next seven years. During this transit we’re all going to be looking at our relationship to the material world, more specifically our money and most importantly, our values. It’s time to see money in a radically different way. Money is energy. And with energy there is always an exchange. That’s why we have a so-called stock exchange. Another word for money is ‘currency’ which is derived from the word ‘current’ or electricity, which by the way the planet Uranus is associated with. Over this period we will see new ways of exchanging value for each other; such as electronic exchanges, virtual currency, multiple currencies, crypto currencies, and precious metals being used to make purchases. One of the major players of the year will be Jupiter in Sagittarius. Jupiter, the planet of exuberance and faith, moved into his home sign of Sagittarius back on November 8, 2018, and will remain here through December 2, 2019. This transit represents an incredible opportunity to believe in possibilities in a way that you might not have in quite some time. However, benevolent Jupiter’s energies can be a bit confusing and misguided at times this year when this giant planet squares up with illusive Neptune – there are pockets of this in January, June and September, possibly causing denial or erroneous efforts which hinder rather than help, so be realistic in your expectations. Jupiter asks do we have a story to tell on our journey. If so, be generous and share it. See yourself as a soul traveler while Jupiter is in Sagittarius, so blog, write, journal or even act your story. Jupiter in Sagittarius is a little bit theatrical. It says it’s all a divine comedy and please don’t take life too seriously. The first Solar Eclipse of the year conjuncts Saturn giving us a serious conservative tone, but a helpful aspect to Neptune lightens the mood. This is an excellent Solar Eclipse for starting or growing a business. It is ideal for creativity, music, artistic projects, and encourages acts of kindness and charity. With integrity and good intentions, it is possible to build our little project into a big business. The first Lunar Eclipse of 2019 on January 20th is opposite Mercury and square Uranus. This signals unexpected events and news that are likely to cause anxiety and uncertainty about the future. So keeping an open mind and staying calm will be very important as we deal with this erratic and unpredictable energy. Otherwise, impulsive reactions, rapid mood swing and miscommunication could cause panic and chaos. The Solar Eclipse in Cancer on July 2nd represents a propitious moment for letting go of the past, but only after we offer ourselves enough time for closure following some less pleasant events. July is going to be very intense, with the potential to purify, cleanse, close some loops, or wounds, or eradicate some unconscious or borrowed patterns, which could be old patterns from ours family lineage. The July 16th Lunar Eclipse will continue the theme of closure, however, it will be a period when we need to work to improve our relationships. If you want to open up your heart, now is the best time. It is a period when we can think of how to love and how to be loved in return. The last eclipse of 2019 on December 25th will especially be strong as it will have Jupiter, Saturn and Pluto in Capricorn and will amplify the energy of this Solar Eclipse. This one has a lot to do with the global structures that are in place around the world. The financial sector and governments are strongly indicted during this eclipse. Get ready for some twists and turns of situations related to money. The possibility of rounding up your income can occur, solutions will be found, but they will be more difficult to shape. Unexpected surprises can occur from a partner, (personal or professional) who could play an important role during this period from a financial perspective. Fortunately this year, Venus and Mars will not be in retrograde motion. Over the past two years each planet has gone retrograde slowing our progress down in varies areas. This will be a welcomed relief in 2019 as these two planets are more personal and affect us more than the outer planets do. The outer planets (Jupiter through Pluto) go retrograde much more because they are further away from the Earth and Sun and are moving at a slower pace from our perspective here on Earth. Retrograde planets give us an opportunity to review our progress and see where we need to adjust our actions. The past is often associated with these cycles and it may feel as if no advancement is being made. The key theme for retrograde periods is to utilize our inner awareness to identify adjustments we need to make. It’s like a meditative period were you see all things from a greater vantage point. This year’s Mercury retrogrades; (the planet that seems to affect us most when retrograde) will mostly be in water signs once again suggesting that we’ll be dealing with emotions on some level. Mercury is retrograde approximately three times a year for approximately three weeks each time. As such, retrograde Mercury is a fairly common occurrence. As the planet of communication, Mercury retrograde tends to breed a certain level of confusion. Mercury rules our “lower” mind–how we perceive and interpret information that we receive from our environment, and how we relay that information to others. Mercury rules over such things as speaking, negotiating, buying and selling, listening, formal contracts, documents, travel, the mail and shipping, and so forth. All of these areas of life are affected when Mercury is functioning in a sluggish state. Decision-making is challenged during Mercury retrograde. It is important to note that there is absolutely no reason to suspend projects or anything of the sort during the Mercury Retrograde cycle. It’s not an ideal time to start new ones or to sign contracts, simply because a change of mind is quite likely once Mercury turns direct. However, it’s a fabulous time to do some “outside of the box” thinking. Acting on our ideas, however, might be best left for a Mercury Direct period. Follow your bliss and have a fabulous year friends! Sun 09° Capricorn 24' 42"
Moon 01° Scorpio 30' 07"
Mercury 22° Sagittarius 38' 47"
Venus 22° Scorpio 41' 03"
Mars 29° Pisces 22' 41"
Jupiter 11° Sagittarius 35' 42"
Saturn 11° Capricorn 16' 43"
Neptune 14° Pisces 03' 50"
Pluto 20° Capricorn 33' 56"
Chiron 28° Pisces 07' 02"